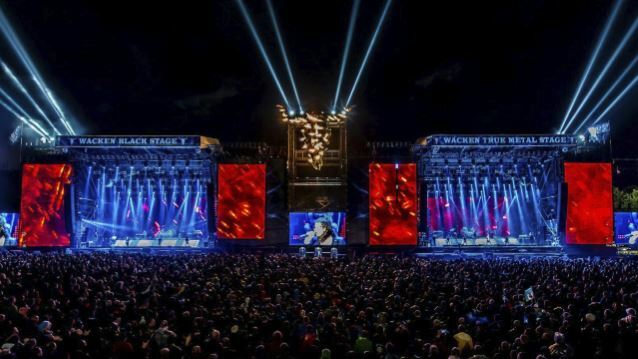 Last night, at the Wacken Open Air (W:O:A) music festival in northern Germany, TRANS-SIBERIAN ORCHESTRA (TSO) and SAVATAGE wowed 80,000-plus attendees with a never-before-attempted music festival performance. Following a 40-minute SAVATAGE set and a 40-minute TSO set, TSO and SAVATAGE band members, across two of the festival's main stages, performed a perfectly coordinated set of fan favorites. This ambitious feat, both musically and logistically, was helmed by Paul O'Neill. Al Pitrelli led TSO on the "True Metal Stage" and Jon Oliva headed SAVATAGE on the "Black Stage." Beyond the unprecedented act of two bands hitting the stage at the same time, this show was also memorable as it marked progressive metal originators SAVATAGE's first show in over a decade, TSO's first European festival show, as well as the only live appearances of both bands in Europe in 2015. Prior to the festival, the bands issued this joint statement: "All of us in TRANS-SIBERIAN ORCHESTRA and SAVATAGE cannot believe the luck that has given us the opportunity to take a break from recording the new (TSO) album 'Letters From The Labyrinth', so that we can meet up in Wacken, Germany and together, look back at how we got here, as well as forward to possibly catch a glimpse of what might be. This is a once-in-a-lifetime show for SAVATAGE and TSO that we hope you will never forget."